Terrible fires hit California (see this Guardian article on California’s hot Christmas future). I’ve lived there, in Los Angeles, and I feel for my many Californian listeners, and everybody in that state. Our two scientists in this show hit this dead on. The first explains how those climate models showing the darkest future, can most accurately show the past 25 years as well. This was tested against data from space. Our second guest explains why California is likely to get more droughts, and more severe droughts than already experienced. No wonder fires burn there. But the culprit is surprising, and the mechanism new to me, and probably to you too. PATRICK BROWN: THE WORST PREDICTIONS MATCH THE CURRENT CLIMATE CONDITIONS. BEYOND 5 DEGREES C? On our current path, by the end of this century Earth could warm over 4 degrees C, way past the danger point. We know that from ingenious work out of the Carnegie Institution For Science at Stanford University. Dr. Patrick T. Brown is the lead author of the new paper in Nature, along with his co-author Ken Caldeira. This paper is setting a fire in science. It’s very bad news about our future, unless we slash emissions fast. 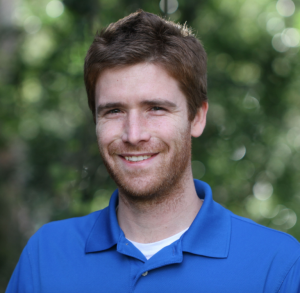 Patrick is a Postdoctoral Research Scientist. Since getting his Doctorate in 2016, he’s published seven refereed scientific papers. Patrick is also a contributor to the fact-checking web site “Climate Feedback“. Patrick Brown has China experience. In 2015, he went to China to teach as part of a Duke University extention program. In his papers since 2016, he has several Chinese co-authors. He’s the lead author of the new paper titled “Greater future global warming inferred from Earth’s recent energy budget” – as published in the journal Nature, December 7, 2017. So we are not even officially looking at possible worst-case scenarios. Glaciologists say a rapid melt event is possible. I’m sorry. I’m having trouble getting past the “5 degrees C is possible” point. Based on more than a hundred interviews with climate scientists, five degrees C warming is like a nuclear war. Both are existential, threatening our existence, and many other creatures as well. Could this happen, is it likely to happen, is this an outlying possibility? I think we are already in a state of climate emergency. The general population and our governments don’t know it yet, but we need to take emergency action to slash emissions. Right now, the Chinese Central government must choose between enforcing their new regulations cutting coal use to make the air breathable – or letting some residents of northern China keep their homes warm with coal this winter. – Somebody has to give up something. Maybe it’s SUV drivers in California, or 600 million peasants in India – but somebody has to give up something soon, or we won’t make it. Here is a good article by Science Daily on this new research. Brown, P. T., Y. Ming, W. Li, S. A. Hill (2017) Change in the magnitude and mechanisms of global temperature variability with warming. Nature Climate Change, doi:0.1038/nclimate3381. Brown, P. T. (2016) Reporting on global warming: A study in headlines, Physics Today, doi:10.1063/PT.3.3310. Disappearing ice is a big problem for northern communities. And it’s sad when polar bears have no ice for their food hunt. But what if a shrinking cover of ice on the Polar Sea could reach much farther down. What if it drives more drought in California? That’s the shocking science news from five scientists at the Lawrence Livermore National Laboratory, located just East of San Francisco. 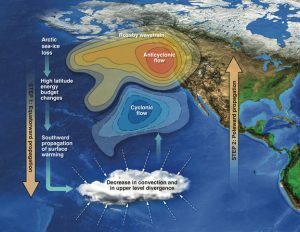 Here is the title: “Future loss of Arctic sea-ice cover could drive a substantial decrease in California’s rainfall“. It was published December 5th in the top-ranked journal “Nature Communications” – just in time for hugely destructive wildfires, again, in California. 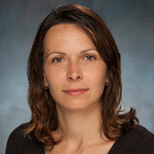 We reached the lead author, Ivana Cvijanovic from Lawrence Livermore. The link to the Arctic is not simple. It’s not a direct drive. We need to understand “teleconnection”. This was first explained to Radio Ecoshock listeners by Dr. Andres Holz, from Portland State University. He told us how changes in Antarctica could affect wildfires in South America, due to teleconnection. Ivana explains what it is, and how that long distance connection can ping pong its way to a “ridiculously resilient ridge” and consequent droughts. The droughts may come and go, but as decades pass, in California drought becomes the new normal. Aside from the fact that I have always been in love with California, that state also happens to be the winter vegetable supplier for western North America, in the U.S. and in Canada. It’s going to be tougher to live there, and harder to find water. If our emissions continue, the arrival of an ice-free summer in the Arctic Sea comes sooner. That is a major change in sea currents, warming, wildlife, coastal erosion, and much less solar energy being bounced back into space by ice that in not there. Please take the time to listen to this interview. It was a learning experience for me. Ivana uses real science to find out how grand, intricate, and interconnected this planet is. The Lawrence Livermore National Lab’s helpful press release about this paper is here. IS CLIMATE SCIENCE BEING SUPRESSED? This discussion began with an email discussion begun by one of my listeners, Louise. She alerted me to an alarming story. One of the most popular YouTube channels explaining climate change was suddenly shut down by YouTube last week, wiping out hundreds of climate videos. It’s the second time that has happened this year, for the Climate State channel. Find out more on that shut-down here. I’m not technically expert enough to explain it all, but I do know this: If you explore climate change on the Net, you will find an overwhelming and constant flow of climate denial videos, and climate confusers. Here’s a tip: to find out about climate, use the search term “climate change” and not “global warming”. The real anti-science uploaders love the term “global warming”, which scientists left behind a few year ago. We can picture the possible sources of that wave of denial videos. There are real believers who convince themselves that tens of thousands of scientists around the world are all part of a conspiracy by… communists, the Jews, the Pope, the Leftist, fill in the blank. Some of them make money with their videos, as they fulfill a human need to deny what could cost us money or a lifestyle we like. Beyond those prolific individuals, there are professional deniers who make a good living, right up to millions of dollars, through selling products, or directly from money paid by fossil fuel companies, electric utilities and others. I suspect some petro-states hire bot farms or workers to just keep uploading climate denier videos every day. They hope to persuade you that “most people” don’t believe in climate change, which is the opposite of the truth. The Climate State channel tried to counteract this constant negative flow with science-based videos. It sounds like Google didn’t like their rate of uploading or something. 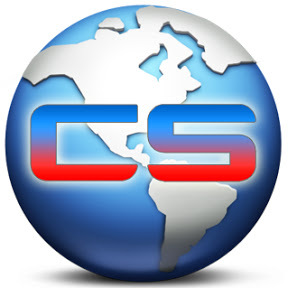 The Climate State channel is back for now. Louise, a regular Radio Ecoshock listener wrote me about the Climate State shutdown. We began a dialog, and I’ll select some of that now. They reinstated it last night. Are we seeing the beginnings of censorship? I have noted in the last 6 month that it is more difficult to find recorded lectures/presentations of recent published papers on the issue Climate Change and I find this unsettling. The other concern is the removal of net neutrality rules in the USA. How robust and resilient is the archive of the information and knowledge we have of Climate Change? If the web were to “go away” or be severely censored would it be equivalent of the burning of the libraries in Alexandria? I’ve given the topic of disappearing knowledge some thought. For example, if an Electro Magnetic Pulse weapon were exploded in the atmosphere high above the United States, it’s possible the whole Net could go down, at least for a while. There are just a couple of major server hubs who route all traffic, I believe for the world. The Internet was designed to overcome a nuclear attack in it’s method of distribution, but over time that hasn’t been watched over with enough duplicate services. However, various countries should still be able to remount a lot of it. Co-ordination between authoritarian regimes bent on climate denialism would be another matter. But even here, there are possibilities for local nets that would be difficult to stamp out entirely. There is also the possibility of collapse of civilization, in which our information society falls back to scattered agricultural pursuits, or people become so angry with the past they no longer wish to hear anything from it. As part of my concern, the back programs for Radio Ecoshock are on two servers, on two continents. I also hope there are a few people who download every program, and burn them to DVD’s. I have noticed a couple of collectors out there. The disappearance of communications may have other causes. In the period 2006 to 2012 I went around recording authors on tour promoting their books. I rebroadcast their speeches in Vancouver, on a different program, which is still archived on my site as “The Brown Bagger” recordings. But those public speeches dribbled off. Publishers could no longer afford the book tours (they said) and they switched to online videos. The art of public speaking, where the audience could participate, ask questions, laugh or gasp, was dying. Things change. I don’t know if the Universities or scientific institutions are cash strapped or just lazy these days, but it’s possible there are fewer presentations to download? I’d be interested in your thoughts and experiences on that. My sense is there are fewer presentations of “fresh research”. I saw a flurry during COP (this year), always at the American Geophysical Union annual meeting (talk about researchers that need to learn how to speak publicly, they can be very painful to listen to!). I see a lot of “rehashing” of research that has been “out there” for several years, lectures where people just repackage and explain the older information in a “different way”. I believe we are starting to see a roll off in the papers/new research being published on the issue Climate Change. The funding has drastically dried up and climate change researchers are frightened for their careers in the US. And I might add, think of the student loans most of these young researchers are carrying in the US, they cannot afford to be without an income source, the stakes are very high for them. NPR research on funding from the National Science Foundation, the source of most research grants for Universities in the USA. And from Climate Central 2016, predicting what is happening. 2. The Chinese! Now this I can verify. I get a science alert service. They send up to a hundred items daily. It’s a chore looking for the gems. More and more, I’m finding Chinese authors as either the lead author, or the whole team. They’ve developed some excellent scientists, and apparently believe climate change poses a serious threat to China. My only fear there is that Chinese culture is so old, so huge, and so self-sufficient, plus the language barrier, that not all the best Chinese science will reach the international community, in time. I expect a new sub-set of science where European language experts pour through Chinese research, translating and communicating from that pool. We’ll see. THIS JUST IN: FRANCE WILL AWARD MULTI-YEAR GRANTS TO AMERICAN SCIENTISTS CUT OFF BY TRUMP! Or as the Associated Press puts in their headline: “France names winners of anti-Trump climate change grants” By Sylvie Corbet, Associated Press Paris — Dec 11, 2017. Then, we have new science on disinformation blogs – which relates to the need for constant refreshing of climate videos, to counteract the constant flow of disinformation via the Net. We can picture a large oil company, or oil kingdom, for whom $50 million dollars a year would be a small amount to buy enough doubt in Western minds that climate legislation or carbon fees never happen, while new drilling and pipelines do. Big money, can buy lobbyists, but also offer vacations or high speaker fees to media personalities. They can propel a couple of willing Professors to be the cornerstone of a single argument, which they try to multiply into doubt of all climate claims, using the domino effect. Jeffrey A. Harvey, of the Netherlands Institute of Ecology, and his colleagues published this paper November 29th in BioScience, the journal of the American Institute of Biological Sciences: “Internet Blogs, Polar Bears, and Climate-Change Denial by Proxy”. The authors urge scientists to directly counter mis-information in blogs. That’s a quote regarding a new paper on climate denial blogs. The paper is here, and a good article on this by Science Daily here. If you would like to add to this discussion, on the fragility of climate knowledge and it’s suppression, just add a comment to the show’s blog. It takes a few hours for your comment to show up, but unless it’s illegal or downright stupid, it will be posted. Thanks for being there, and please join me in coming shows for more science of the future. It’s disappointing that you see fit to carry “news” of so-called internet bots promoting climate denialism paid for by “petro-states.” Presumably this is referring to Russia. There is not a scintilla of evidence for this insanity which is promoted by Climate Crock guy Peter Sinclair who has been conducting an insane anti-Russia crusade for the last year. You don’t need to go to Moscow to find climate change denialism. It is very much alive in the United states and the UK, represented by outfits like the Heartland Institute, CATO Institute and a squillion others funded by American fossil fuel interests. The anti-Russian lunacy may have very real consequences in the form of a nuclear war. Russia, which is Public Enemy #1, has a GDP of less than 10% that of the United states is continually being represented as a threat. The one area whereby it can strike back is the nuclear arena, since it has not far short of 2000 ICBMs to hit the US and take down humanity in concert with the nutters in Washington. Nuclear winter is not the way to solve Climate Change and in any case the crude racism in the anti-Russia crusade would not be tolerated by you or anyone else on the Left if it was being promulgated against any other ethnic group. Actually, I was not thinking specifically of Russia, although you raised it “Tsar”. Absolutely I was thinking of American, British, and other oil majors, and oil supply businesses, pipeline companies, and heavy fossil fuel consumers, like power companies (plus lobby groups and faux “institutions” paid by all of the above). As you say, we don’t need to go far to find climate denialism. I was not tuning into the Russia dialog, and if I was, would say so directly. I think the economic data suggests that the unconventional oil is headed for a big crash soon. The net energy is too low and consequently it is proving to be a millstone around the necks of the frackers and the deep water drillers. It seems that the effects of peak oil may have been postponed for maybe a decade by low to zero per cent interest rates, a decade which may have been crucial in getting global emissions under control. You touched on the net enrgy question when you interviewed a man about Scottish energy a few months back as I recall. Steve St Angelo seems to have done a lot of delving into balance sheets to come up with an incredibly gloomy set of forecasts for the world economy and world civilisation.